Coming off a 13-11 slugfest victory over Power Outage on Friday, the Reds capitalized on an error by the Mobsters’ left fielder with the game tied at 1-1 in the first inning, then broke the game open in the second, en route to an 18-2 whipping, to close out weekend play in the BVI Softball Association Juliette Penn league on Sunday night. 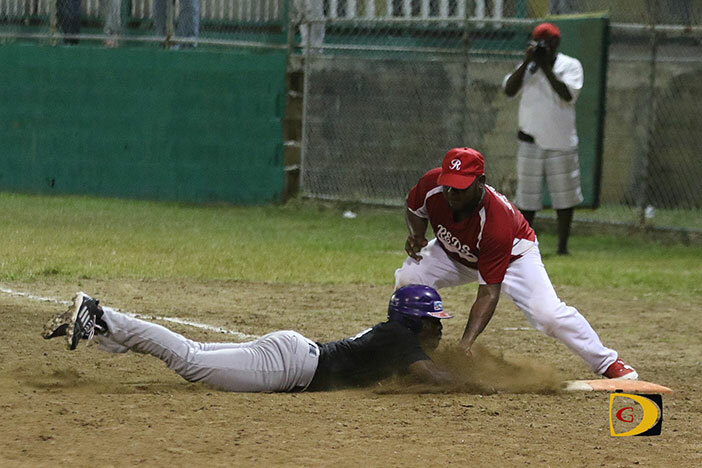 The Mobsters were coming off Friday night’s 20-12 loss to defending champs Pirates. The Reds batted around in the second inning, scored nine runs on six hits in building a 14-1 edge. They finished with 18 runs, 16 hits, five errors and three runners left on base. The Mobsters’ 2 runs were on 4 hits, 3 errors and 5 left on base. Lionel Hodge was the winning pitcher, Sirron Sctliffe took the loss. Franklyn Mercado had a 3-for-4 game for the Reds with two homers and 5 RBIs. Kyle Lamotta also went 3-for-4 with a double, triple, three runs scored and two runs batted in. Leon Martin finished 3-for-3. He scored twice and had 4 RBIs. Miguel Hernandez had two of the Mobsters four hits on a 2-for-2 night. He also scored one of their two runs. The Pirates diffused Power Outage, 12-5 on Saturday. The winning pitcher was Allen “Woodrow” Smith and the loser was Dariel Robinson. Pirates’ Kye Rymer went 2-for-3 with a double, a triple, 2 runs scored and 3 runs batted in. Levron Saurauw homered in two at bats. He scored 4 runs and drove in 2 runs. Jeremy Penn of Power Outage, homered twice in three at bats and finished with 4 runs batted in. He also scored twice. In women’s play, debutants That’s Your Problem defeated the West End Warriors 22-2, as Chevaunne Richardson tossed a no-hitter. That’s Your Problem had 22 runs, 14 hits, 2 errors and left 3 runners on base. Warriors had 2 runs, 0 hit, 8 errors and left 1 runner on base. Shanique Robinson took the loss. Tyalia Nibbs-Henley of That’s Your Problem, went 2-for-3 with 3 runs scored and 3 runs batted in. Tyjenica Maduro-George, had a 3-for-3 game with 2 runs scored and 2 runs batted in. The unbeaten Hawks slowed That’s Your Problem, 15-4 in Sunday’s first game. The Hawks’ 15 runs came off 8 hits, 3 errors and they left 6 runners on base. That’s Your Problem had 4 runs, 4 hits, 8 errors and stranded 3 runners on base. The winning pitcher was Perline Leonard and the loser was Thea Cooke. Javlyn Frett of the Hawks was 2-for-4 with a run scored and 4 runs batted in. Laura Isaac went 2-for-3 and drove in 2. That’s Your Problem’s Tafara Phillip doubled in two at bats and finished with 2 RBIs.